From Palomar Sports Information Dept. 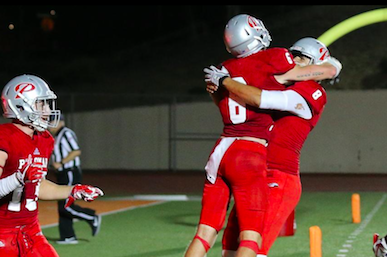 ESCONDIDO (9-15-2018) / (REVISED 9-18-2018) – After battling a Citrus College team that won its first two games 52-13 and 75-0 to a scoreless tie for most of the evening on Saturday, Palomar fell behind 10-0 in the fourth quarter, then came to life in the closing minutes to send the Owls packing back to Glendora with their first loss. The Comets scored their first points of the night on a 3-yard run by Vista Murrieta High’s star 2017 running back DeVion Sneed with 4:42 to play. 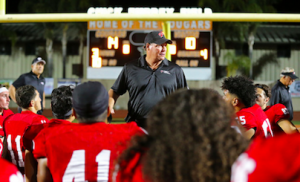 Then they stunned the Owls with their first loss 14-10 on an 11-yard pass from Carlsbad High’s Shea Morales to Cal transfer Logan Gamble in the middle of the end zone with 54 seconds left at Escondido High School’s Chick Embrey Field at Wilson Stadium. “As soon as the defense got us the stop (following Sneed’s TD run) I knew we had a chance, and as soon as the play was called I knew (Gamble) would be wide open. 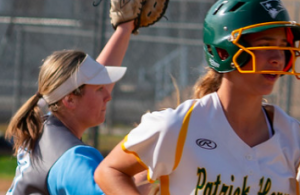 We work on that play all the time in practice,” Morales said. Gamble was by himself behind Citrus defender Harry Goodwin in the end zone, Morales laid the ball in his hands with a perfect pass and the rest is history. “He made it easy for me and our line did a great job keeping them out all through the last drive,” Morales added. After Citrus took the 10-0 lead the Comets came to life when David Wigand (Mission Hills High), who returned two kickoffs for 55 yards on the night, returned the ensuing kickoff 29 yards to the 50-yard line and, behind Sneed’s runs and a key 9-yard completion by Morales to 6-foot-1, 260-pound fullback Arnold Yoder, took the ball down to the Owls’ 11-yard line. But a bad snap that resulted in a sack pushed the ball back and Palomar missed a field goal. After Palomar’s defense forced Citrus to punt, Morales completed passes to Bryce Walker and Devin Nilson (Carlsbad High) and, after a sack, hit Sneed on a 33-yard pass play down to the 7-yard line. Sneed carried 4 yards, then scored on a 3-yard run to get the Comets on the scoreboard. 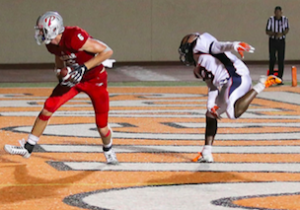 After the teams traded possessions, Palomar again forced Citrus to punt and took over at its own 35-yard line with 1:52 left in the game. Morales hit on completions to Walker, to Johnny Armentrout (El Camino High) for 14 yards, to Shevell Sterling (Grossmont High) for 8 yards and to Nilson for 17 yards, and a facemask penalty again positioned the Comets at the Owls’ 11. Morales then passed to Gamble for the winning TD, and Jacob Vose (El Camino High) kicked the PAT. With Citrus out of timeouts, sacks by Isaac Tuia and Yusuf Leigh, the latter on the final play of the game, cemented the victory for the Comets. Nilson caught five passes for 48 yards and punt returns of 8 and 31 yards. Safety Giovanni Herra (Mira Mesa High) had a big night for the Comets defensively with seven tackles (all of them solo), including a sack / tackle for loss of 15 yards. 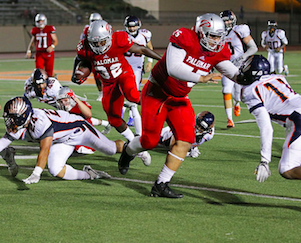 In all, Palomar sacked Citrus’ quarterbacks five times for 55 yards in losses. The Comets’ other sacks were contributed by Yasuf Leigh (Temecula Linfield Christian High), 2 for 9 yards; and down linemen Mason Simeta, 1 for 6 yards, and Isaac Tuia, 1 for 5 yards. Cornerback Louie Flores (Mission Hills High broke up three passes. Linebacker Spencer Kaoanga (Oceanside High) and Simeta had a series of big defensive plays in the fourth quarter. And punter Jacob Stepanek again had another big night for the Comets, pinning the Owls inside their own 1-yard line and finishing with three punts inside the 20. They couldn’t take advantage of the punt to inside the 1, and soon after couldn’t get into the end zone after a first-and-10 at the Citrus 7. Palomar again attempted to self-destruct with a series of untimely penalties but not when the game was on the line. 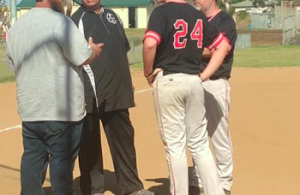 Coach Joe Early’s Comets will go on the road to play Ventura and Grossmont College the next two weekends, then will host defending state and national champion Fullerton College, an 85-0 winner over Santa Ana on Saturday, in their National Division Central League opener on Oct. 6. 3 09:16 Citrus – Sean Bailey, Jr. 19 yd field goal. 4 11:41 Citrus – Major Lee 11 yd pass from Austin Zavala. (Sean Bailey, Jr. kick is good). 4 04:42 Palomar – DeVion Sneed 3 yd run. (Mark Meader kick is good). 4 00:54 Palomar – Logan Gamble 11 yd pass from Shea Morales. 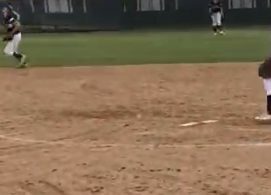 (Jacob Vose kick is good).